Crap, it’s the time I said I would go to bed tonight and I haven’t written anything about the awesome that was this weekend. Yes, awesome is a noun. This weekend brought me from two crushes to barely a half crush. I spent two fun nights out with friends, the first of which was rather informative, the second was more fun than I could possibly describe and will have to be planned again. I’m super behind on homework already though, and any chance of me getting up early enough to work on any tomorrow requires me going to bed now. Starting tomorrow I’m going to be productive! More What You’d Call "Guidelines"
I’ve been a little frustrated lately. By lots of things. One of them being that I’m remembering how I was in a better place when I was going to church regularly and I would like to start going again when I can. I don’t think that church itself is exactly what I’m looking for right now, but it certainly has elements of what I would like to bring back into my life. I think part of what I was originally looking for when I started going to church in March was some sort of guidelines or rules to live by and give me some order. I learned a lot while I was going, and incorporated some things into my life that I’ve really liked. There were also some big things that I realized were not for me, which contributed in a big way to my recent lack of attendance. In realizing that I might like to go back, I also realized that I don’t have to solely go by the rules prescribed by a church. They may have a lot to offer, and they may work for a lot of people but at the same time they may simply not be right for me. Instead, I can make up my own rules! What an awesome idea! If I want direction and structure, but I don’t feel that I get that adequately from an outside source, why not create my own? A Katherine Code, if you will, which is really more what you’d call “guidelines” than actual rules. I know that I’ve done something like this before, and I haven’t kept up with it, but I don’t think that my drive and motivation were the same then, and I didn’t really follow through with putting it into some physical form. This time I’m going to make sure that happens. I may share more about what kinds of rules and guidelines I’ll be creating, but for now I’m just going to let it all marinate and get on with a busy day! No Babies, No Cancer Day! I had a Lady appointment today! It was with a male doctor, which I’ve never done before. I didn’t have any hesitation, I mean he’s a doctor, and it’s more important to be healthy than to be completely comfortable for the few minutes of the appointment. I had almost hoped for something outrageous, or at least outrageously awkward or embarrassing, to share from the experience. It was actually probably the least awkward pap I’ve ever had. Dr. Ruggles (seriously, that’s the funniest thing about it all) explained everything, and ordered my birth control from the pharmacy right at the beginning so I had less time to wait for it after the appointment. The only thing that he didn’t explain was why he brought the nurse in for the actual examination. I actually happen to know that they bring in a female nurse just to make sure nothing funny goes down with a male doctor and a female patient. For someone who isn’t aware of things like that, it might seem a little weird to bring in another person for such an exam. Just a quick mention would be kind of nice. Tomorrow will be a bit of a crazy day, and it will be starting at 4:45, so it seems that almost 11 PM is time for bed! I had a very productive day! Woke up smiling and being distracted from studying. Eventually got to study, and then took a final for a class that I hope to pull a B in. After the final I had a few hours before work, so I decided to go for a jog, and combine that with the errand I needed to get done! I ended up walking because my workout pants are too big for me now and fall when I run it seems. I ended up going for about 3 1/2 miles in around 45 minutes. I couldn’t get the errand done, but I did find out more information about it, I guess. I made it to work on time even though I fell asleep less than an hour before I should have been there! Tomorrow I intend to be just as much if not more productive! I might just be crazy! Click for a larger image of course, and see just how crazy I am! Those are the classes that I am currently enrolled in for the fall semester. There are LOTS more that I would love to take, but I do have to have time for homework for these classes, and you know, actual WORK. 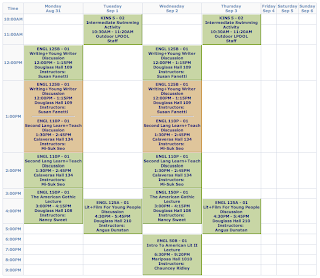 With some luck though, I’ll be able to figure out a pretty regular work schedule on campus so that I don’t have to worry about a changing schedule. I just remembered that I should have more freedom from money next semester, so I won’t even need too many hours working, which is pretty awesome! It’s been hot in Sacramento lately. Not exactly hot enough that it justifies leaving a fan on all day when only the cats are home, yet my roommate does it. The bathroom stays pretty cool, and they hang out in there anyway, why leave the fan on in your room if there is no one to benefit from it? If I didn’t already move so much I’d be really tempted to find my own place and just make sure I work more next semester. I’ve really enjoyed dancing the past several weeks, and can’t wait to learn more. If anyone reading this knows more than me (and I know there are at least two of you) please share with me what you know! Watching some videos of friends completely intimidates me, but also excites me and motivates me to see how far I can go! I had a pretty productive day today. After completing an “exercise in time management” provided by my English teacher (it’s funny, time management isn’t in the course description or the syllabus) I went to the grocery store and got some gas. I don’t actually remember the last time that I got gas, but I’l try to pay attention to the next time that I do. I love living so close to everything that I do! While I was at the grocery store I bought the items pictured below. To avoid eating most of the box in just a few sittings, I bought the snack bags and divided it up! I have some pictures of a car that I see a lot that amuse me, but I think I’ve made this entry long enough, and I might forget all the things I think of tomorrow to write about, so I will save it until then!